If you’re keen on enjoying a luxurious rural retreat in 2016 look no further than Relais & Chateaux Langdon Hall in Cambridge. Located just a short road trip away from Toronto, Langdon Hall is Ontario’s poshest petite palace. In recent years the property has garnered a long list of swoon-worthy accolades, placing her in the choir with Canada’s creme de la creme. No doubt about it, she’s Ontario’s best kept secret! Langdon Hall is a proud member of the Relais & Chateaux family. Each property within the Paris-based group is privately owned and operated. Fans of the brand return time and again to indulge in a consistent guest experience which focuses on showcasing the “5 C’s”: character, calm, charm, courtesy and cuisine. Today, Canada plays home to 14 Relais & Chateaux properties, with Langdon Hall acting as the one and only in Ontario. Langdon Hall still exudes the air of an old Ontario estate, but few people are aware of the international connections in the property’s hundred-year history. Built in Canada by the son of an English man who inherited American wealth, the grand home was intended as a summertime contrast to life in New York, London and a chateau in the Loire Valley. Now owned by William Bennett and Mary Beaton, their Country House Hotel is now known across the globe for serving up fine fancies to discerning globetrotters. On my second visit to Langdon Hall I brought my friend Will along as partner in crime to enjoy festive sips and nibbles just days before Christmas. 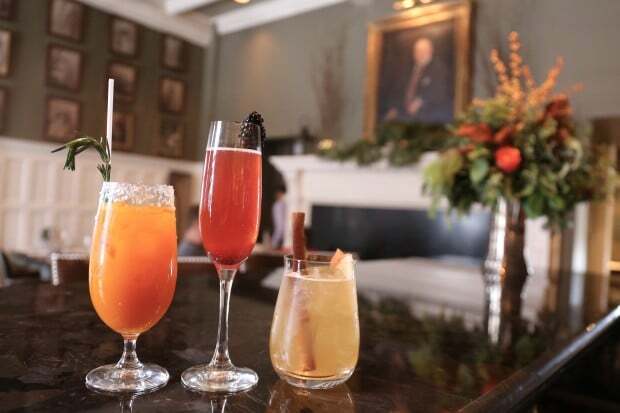 If you’re mantra going into 2016 is “treat-yo-self,” find inspiration at Langdon Hall. 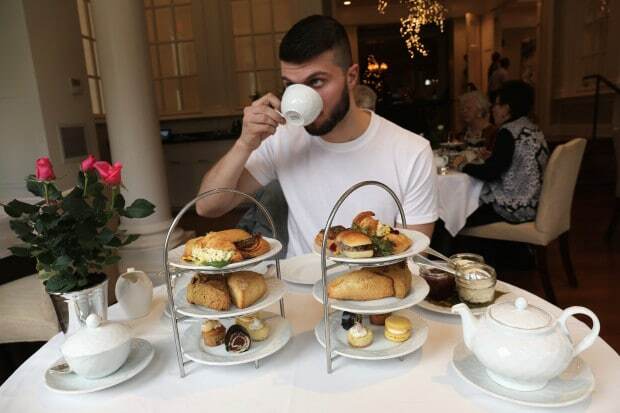 Slip down into Langdon Hall’s elegant dining room and shortly after you’ve rubbed your eyes, let out a wee yawn and stretched your arms towards the chandelier dangling from the ceiling you’ll enjoy the aroma of freshly roasted coffee slipping into your cup. With a whisper of cream and petite sugar cube this is how we begin the day. 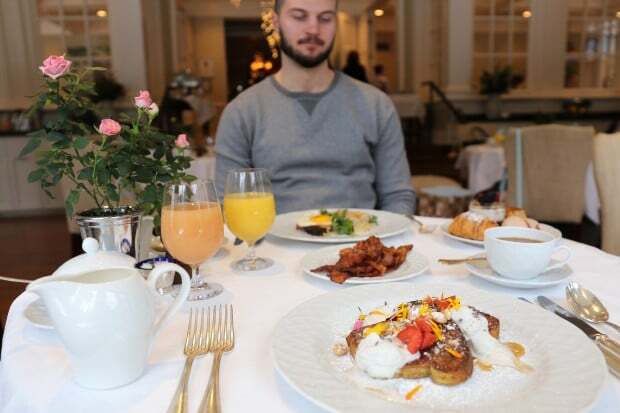 Breakfast is served an an antique harvest table in the centre of the dinning room and features sweet preserves, freshly baked pastries, charcuterie, fromage, smoked fish, sliced fruit and yogurt parfait. Seasonal a la carte options are also available. Swoon for mornay slathered croque madame and lavender cream topped brioche pain perdu! Later in the afternoon, cozy up with a hot pot during Afternoon Tea service. The Langdon Hall tea menu offers kitchen-baked scones and preserves served with a breathtaking view overlooking the gardens and Carolinian forest. It’s one of the most popular High Tea’s offered in Ontario as the culinary team spares no expense in making each morsel an edible art. Sweets and savouries reflect the season in which you visit. Just days before Christmas we nibbled on “pumpkin and nice spice scone,” turkey rilettes stuffed rosemary pain au lait and creamy eggnog cheesecake! If you’re pining for a bit of pool play, stroll into the Billiard Room after grabbing a pint of fresh suds from neighbouring Wilk’s Bar. Be sure to order a glass of 1898 Pale Ale, brewed exclusively for the property by local, award winning Grand River Brewery. 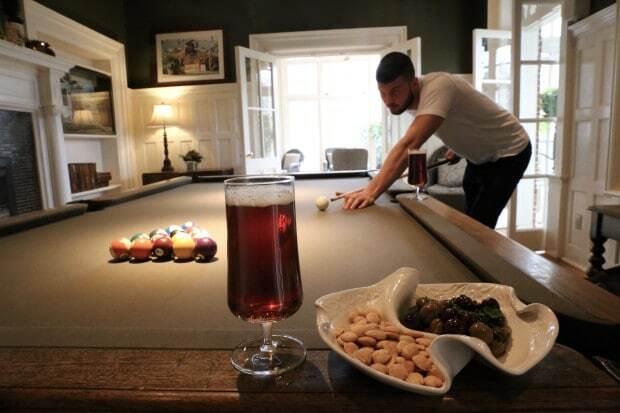 Take a break between sinking each ball into leather bag by nibbling on complimentary bar snacks featuring roasted marcona almonds and house marinated olives. One of the most exciting new developments at Langdon Hall is the construction of an impressive which will play home to a world class spa. The new 7,500 sq ft wellness centre will feature a reception + gift shop, makeup counter, change rooms, whirlpool, steam room, sauna and lounge with adjoining garden patio. 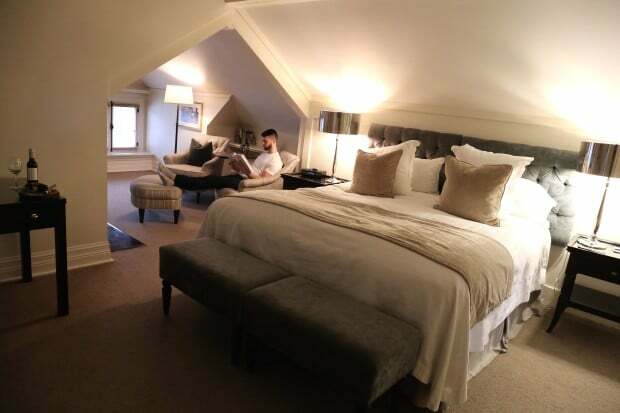 The space will also feature 12 treatment rooms including one for couples massage (romance), two body/wrap rooms each with a full shower, one Vichy shower room, four pedicure chairs and three manicure stations. 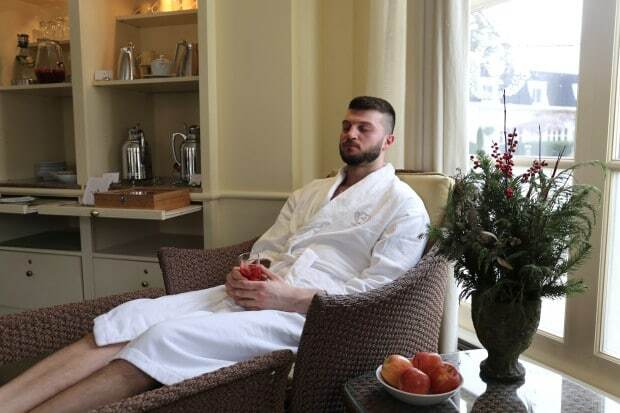 During my visit I met with Julie Simcox, Langdon Hall’s Spa Manager who toured me through the current space before dropping me off at a white marble floored change room featuring bubbling whirlpool and cedar-lined sauna. After wrapping myself in a plush robe I waddled over to meet my therapist, who for the next hour slathered my feet in peppermint oil and massaged my body in wild orange and lavender aromatics. Langdon Hall is located on a sprawling 75 acre estate which features 12km of winding nature trails through thick forrest. Skip under massive maple and pretty pine at a leisurely pace or if you have a need for speed, hop on a Schwinn bicycle and cruise through refreshing Boreal breeze. 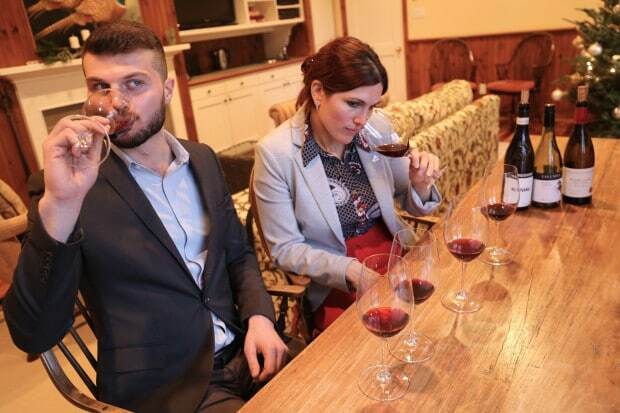 One of Langdon Hall’s hallmarks is its daily complimentary wine tasting in July & August or year-round Saturday Tasting. An intimate group of hotel guests arrive at 4pm for a themed tasting, allowing you to liven your tastebuds before you waltz over to dinner. We enjoyed a private tasting with Sommelier Faye MacLachlan who poured a trilogy of robust reds. Langdon Hall has an astounding selection in their storied wine cellar which features over 1500 labels and over 10,000 bottles. An oenophiles delight! My favourite place to rest and relax in Langdon Hall’s manor house is Wilk’s Bar. In winter the cozy space features blazing wood burning fireplace which perfumes a room filled with comfortable chairs and time period photos of Langdon Hall’s original founding family. The hotel’s culinary mantra is to use local, seasonal ingredients whenever possible, many of which are plucked from the hotel’s gardens and greenhouse or foraged deep into the woods. The mixologists here really have fun with fluids, steeping spirits with foraged bark, fragrant herbs and bright berries. Recently, Sommelier Faye and Gardiner Mario worked together to create a seasonal barrel aged cocktail, which was a complete blend of bourbon, apples, grapes, ginger root and a variety of herbs. 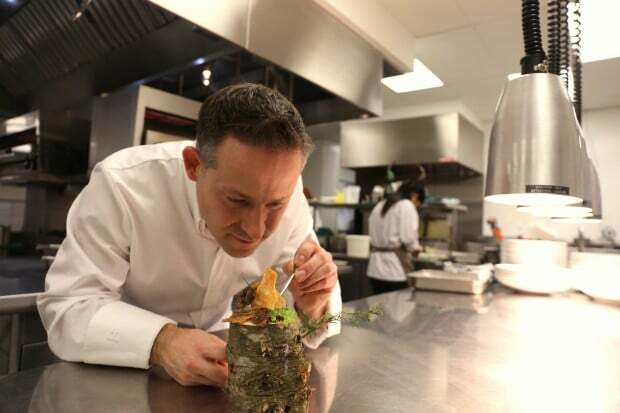 Chef Jason Bangerter is one of Canada’s most celebrated culinary champions. Early on in his career he enjoyed stints cooking in top notch kitchens in England, France, Germany and Switzerland. After returning home he became beloved by Toronto’s food community during his tenure at Oliver & Bonaccini where he inspired the menus at award winning restaurants Auberge du Pommier and Luma. Gold Medal Plates, Toronto 2014 – Bronze Medal, fundraising chefs competition for Canadian Olympic and Paralympic athletes. The Good Food Innovation Awards – Gold by Food Day Canada for the demonstration of an innovative Canadian menu. Relais & Chateaux, Gourmet Fest at Carmel by the Sea – selected as the only Canadian Chef to take part in this 60th anniversary celebration. It really goes without saying, “you haven’t been to Langdon Hall unless you’ve fine dined yourself silly.” Each evening, peckish guests experience a true Sense of Place cuisine with items inspired by the hotel’s gardens, paired with a perfectly curated wine pairing via epic Chef’s Tasting Menu. The offering changes seasonally as Chef Jason’s team strives to incorporate the best ingredients from the field, farm, forest and water. 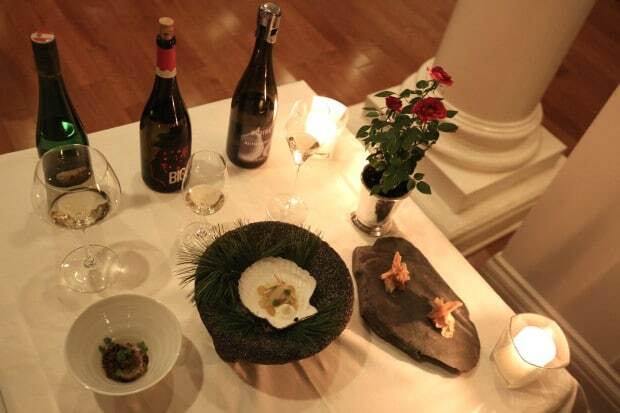 Chef Jason created a decadent 10 course Truffle Tasting this holiday season. Fond flavours I won’t soon forget: liver parfait with crispy skin cracker, lobster with beurre blanc topped with sturgeon caviar and wagyu beef resting on foraged mushrooms and watercress. After sipping and nibbling through a 10 course fancy feast my first urge is to flop into a comfy bed and relish in that food coma. 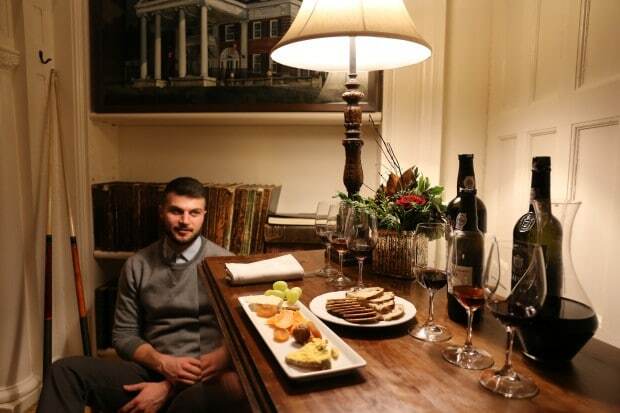 We resisted the temptation, and pressed on to enjoy a late night Port & Cheese Tasting which was set up for us in the Billiard Room beside a few loose cues. A selection of three fine ports were paired with a trilogy of fresh fromage featuring cheve noir, mimolette and stilton. This post-dinner embellishment is just another example of how the Langdon Hall team look to perfect the guest experience by offering up the unexpected. All weekend guests also have the opportunity to participate in cooking demonstrations every Sunday at 10:30am. To truly appreciate the amount of work that goes into creating Langdon Hall’s meticulously curated culinary program one needs to take a stroll through the property’s garden and greenhouse. During the warmest months of the year, guests watch as cooks pluck fruit and vegetables straight out of the soil. 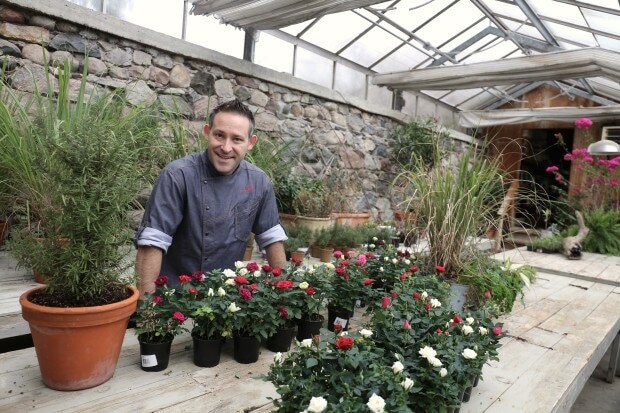 While strolling through the greenhouse in December Chef Jason explains how moving from the city to managing an onsite growing program has left him refreshingly inspired in the kitchen,”having the farm here changes how I cook. I walk through the garden, put an ingredient in my mouth and then find inspiration for a new dish.” He’s got every chef’s dream job, clearly inspired by his surroundings, he rubs lemongrass between his fingers, tickles a rosemary bush and speaks about his candy cane beets, brussels sprouts and thumbelina carrots as if they were members of his immediate family. And that’s why I suppose Langdon Hall leaves a lasting impression. If the carrots are kissed each night before bed, you’re likely to feel as though you were to!